The drive to Packwood takes roughly 2 hours from Orting. Our trip was on a bright, cold day. 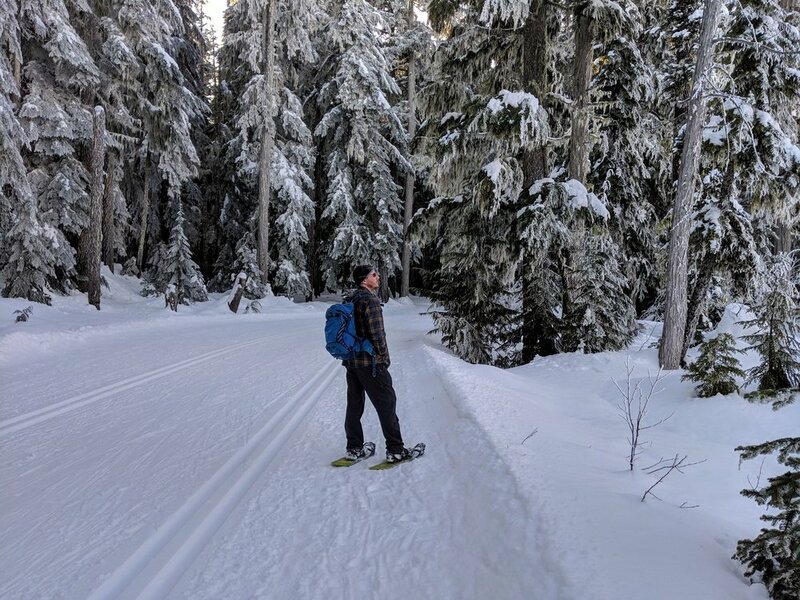 We were heading to Packwood for two reasons; to stay a night at Millard’s Cabin and to snowshoe in White Pass. We only made a couple of stops in route for refreshments and at a viewpoint for Mt. Rainier. 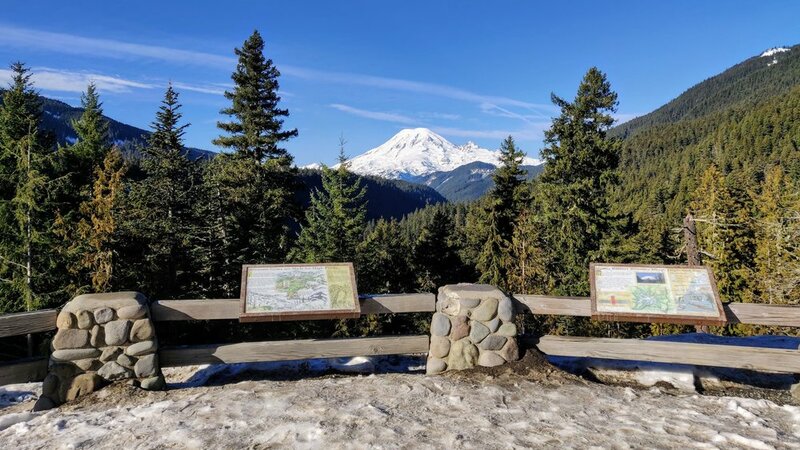 On such a beautiful day, we could not pass up the view with such a great shot of “the mountain.” Before this stop, we had seen little snow and were beginning to question our decision to snowshoe. We arrived in White Pass around 12:45 in the afternoon. Both sides of the road were packed with vehicles. Parking lots were full, people were everywhere, and we were a bit discouraged about finding a place to park. The ski slopes across this main road were crowded with skiers and snowboarders, similar to sprinkles on a white icing cupcake. We, fortunately, were heading for White Pass Nordic Center just opposite the busy slopes. We finally found a vacant spot, parked, grabbed our snowshoes, put on our packs and trekked to the yurt to buy passes. 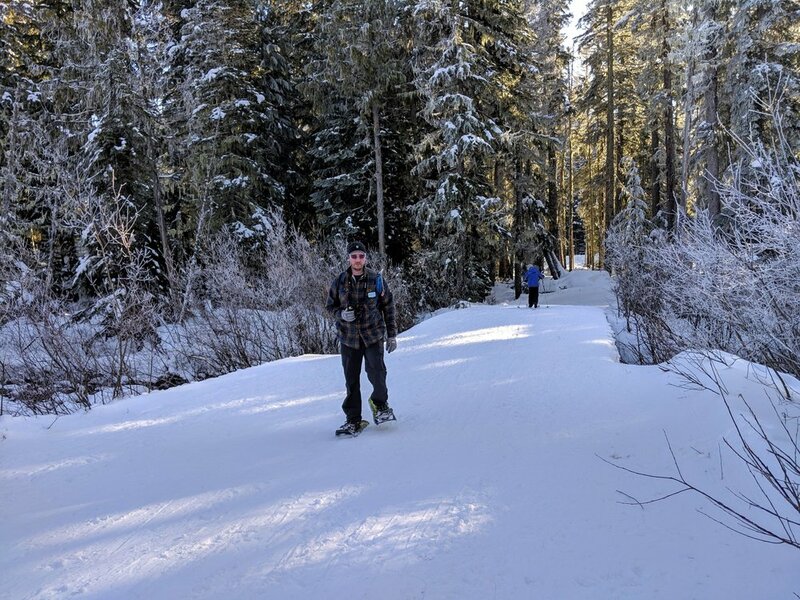 There are many snow activities available at Nordic Center; cross country skiing, fat tire biking, and some sledding options. Equipment can also be rented here if you do not have your own. Passes attached, we stepped out onto the snow, strapped on our snowshoes and made our way to the snowshoe trailhead. 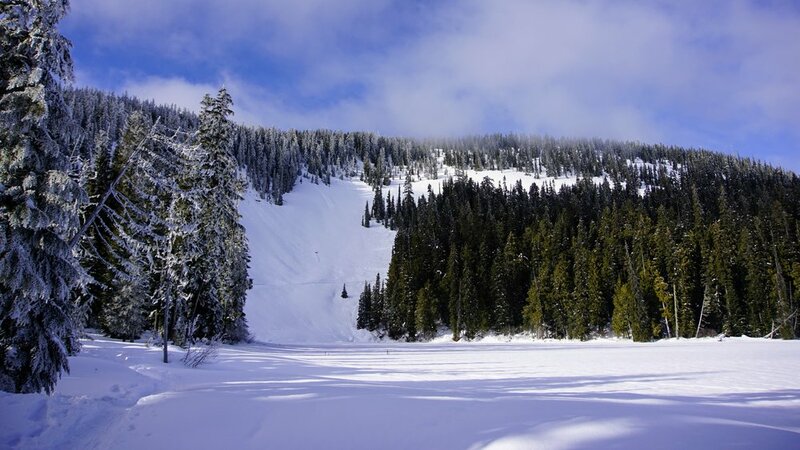 There are seven miles of snowshoe trails crisscrossing the Nordic Center. 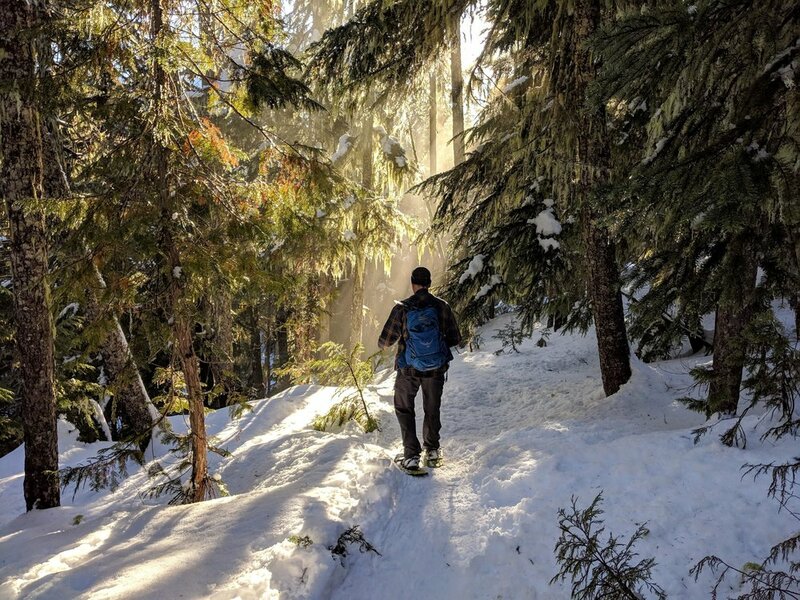 In contrast to the well-groomed cross-country routes, the snowshoe trails are a rustic weave in and out of the trees, along creeks, over bridges, under downed trees and zig-zag up and down some hills. The trees all around were frost and snow-laden. The sun glint off ice crystal prisms within the snow creating a fairy tale blanket of sparkles. Our path was well marked with orange signs as we came to intersections with other activity trails. Our sunglasses were on and off frequently as we passed from shade to sun and back again. We ultimately made our way to the “Falls.” We were pleasantly surprised with this modest set of falls, as we really did not know about them. We took a different set of paths back to our starting point. We had spent a solid 2.5 hours on the trail. It was nearing 4pm now, so back in the Jeep, we headed to Millard’s Cabin. This would be our lodging for the evening. We had worked up an appetite. We planned to drop off our gear, change clothes and find a place to eat. 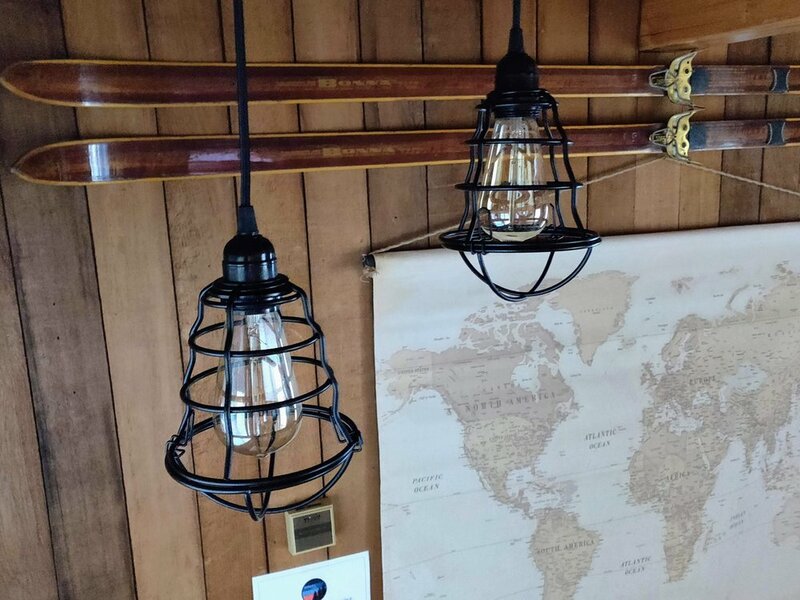 Upon arriving at our cabin, we were immediately charmed by the lights strung along the pitched porch roof, just one of many thoughtful details we would discover. Stepping inside we were greeted by a handwritten note on a chalkboard door welcoming us. We immediately turned on the fireplace, snowshoeing is a chilly business after all. 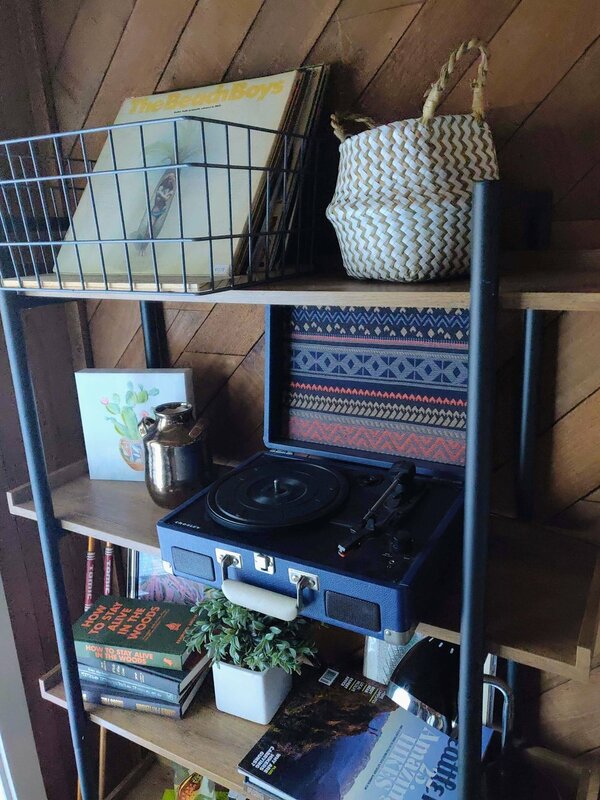 The living room was cozy with a wall mounted television, a cushy overstuffed couch and sling type chair to the side, pillows and throw blankets in abundance along with games and other interesting decors. We couldn’t help but feel comfortable just being in the space, and that was without having even sat down yet. The kitchen was small and tidy with open shelving up top that gave a modern, functional sense. The bathroom with stand-up shower was equipped with a tankless hot water heater—very efficient—and the door was a space saving slider. This was all on the lower level of the main cabin. A set of wooden stairs took us to the A-frame loft. This large room was divided by the stairway and a low wall. On the right side of the room a queen size bed was centered and flanked by matching bedside tables, upon one table was a bottle of water for guests. The left side of the room featured two separate beds with a nightstand between them, also hosting a bottle of water. Lights were strung along the A-frame on both ends, providing ample illumination but also lending to a relaxed atmosphere. The log lamps and framed postcards, candles, and greenery reinforced the appealing lodge vibe. Quickly changing clothes, we looked at the other chalkboard in the kitchen, which listed suggestions for guests. We decided to try Cruiser’s Pizza, which was just a short drive away. Cruiser’s was hopping, and the line upon entering was long, but we were hungry, and the pizza looked good. We endured the wait and made small talk with a couple of locals also in line. Once we ordered our pizza, we seated ourselves and waited about 25 more minutes before our order was brought to our table. The large, veggie pizza was more significant than we expected and delicious. We enjoyed some slices then decided we would check out the newly opened Packwood Brewing Co. The brewery opened in what appeared to be a rather old business storefront. Large front facing glass windows and exposed rafters with a big fireplace gave this sizable open space a rustic character. We stepped up to the bar and ordered an IPA and a cider. The signs behind the bar were a combination of chalkboard, wood and paper, listing snacks and brew varieties. Our beverages were served in plastic cups, just an indicator this was a new business. The room hosted long tables, cushioned seating near the fireplace and stools at the counters along the front window. We sat near the windows and lingered over our drinks, recollecting the events of the day. After a time we made our way back to Millard’s Cabin. The homey comfort was just the thing we needed. We cozied up on the couch, with dimmed lights we sat by the glow of the fireplace and admired the quiet. This was peace. It didn’t take long for us to begin nodding off, so we made our way to bed and slept soundly. We awoke early to misty morning views from the back porch of the cabin. We readied ourselves for the day. We investigated the bunkhouse just off the back porch, which boasted plush comforters and pillows for a very comfortable looking night’s rest. The wall heater had this space nice and cozy this chilly morning. 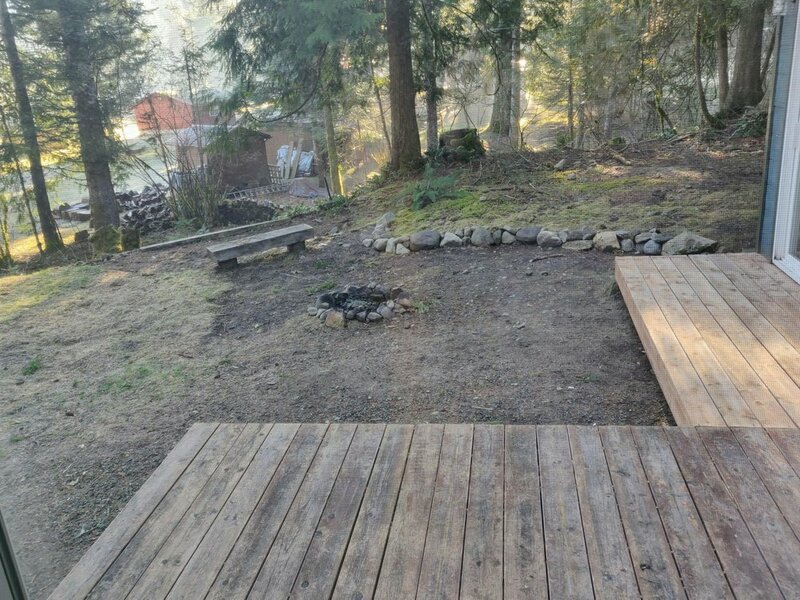 The small backyard had a fire pit and a nearby bench that brought to mind evening around the campfire roasting marshmallows and swapping tales. We took photos and roamed around the yard admiring our temporary home. The end of the driveway at the street hung a custom wooden sign with “Millard’s Cabin” and the address, one of many charming touches Luke and Sarah have lovingly added to the property. We packed up our things, took a few more photos then made one more stop at the Mountain Goat Coffee Company. A mocha and freshly baked scone made for a delicious breakfast on the go as we began our drive home. We had had a really lovely stay in Packwood. Time enjoying the outdoors in a spot we’d never visited before, good food and drinks, and a very comfortable stay made this a great trip. 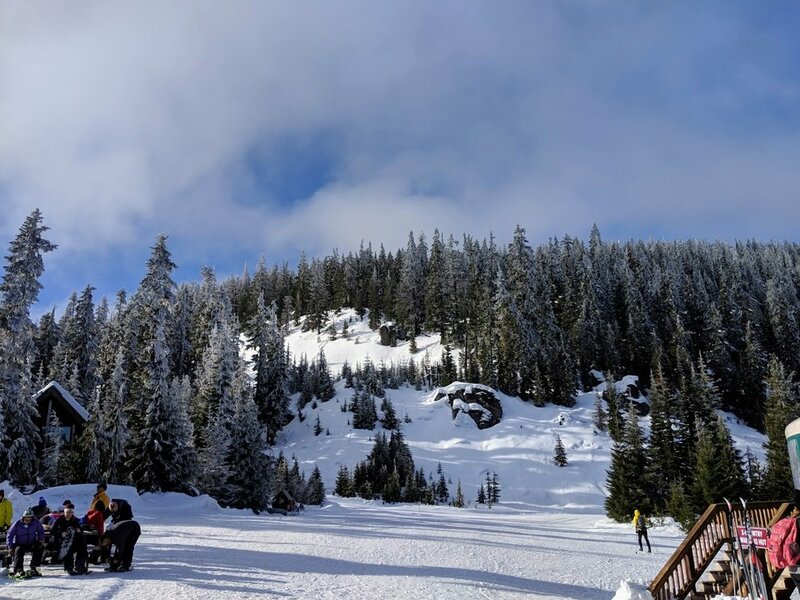 There is a lot to do in the Packwood area. In the warmer months, we’ve visited nearby Layser Cave and Grove of the Patriarchs Trail, each of which is a fascinating spot. Tell us about your favorite places in and around Packwood by leaving a comment below. Happy Trails! 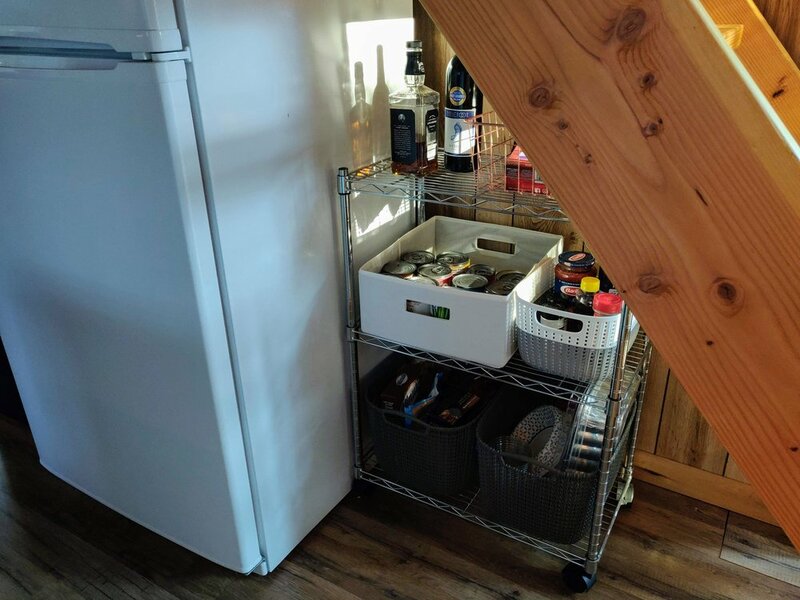 Our overnight stay at Millard's Cabin was provided free of charge in exchange for this blog post. All content written was of our own thoughts and opinions.